A renewed slide in gold prices commenced shortly after the release of the Fed’s Beige Book on Wednesday afternoon and it then intensified into Thursday with the parsing of the Bernanke Congressional testimony. Both of these events contributed to frustrating the commodity bulls who expected more bad news from the Beige Book and more than just hints of an imminent QE from the Fed Chairman. After touching highs near $1,640 early on Wednesday, spot gold prices decisively broke the $1,600 psychological support level prior to midday yesterday. The $1,580 support zone was thereafter breached as well and spot gold touched lows near $1,575 before settling down $31 on the session at $1,588 the ounce. Gold is now only ahead by 2.84% on the year-on-year Kitco net change chart. Silver gave back the previous day’s gains and ended down 84 pennies at $28.59 per ounce. The white metal is trading at about 25% under its one year-ago level. Overnight, gold prices slipped further and reached lows at under the $1,565 mark while silver traded under the $27.90 level. Platinum saw lows at $1,410 while palladium touched $607 per ounce. As of this writing, in New York, we were offered the following bid-side quotes in the precious metals: Gold down $13 at $1,575, silver down 43 cents at $28.16, platinum down $25 at $1,412 and palladium down $16 at $606 per ounce. Background market indications had the US dollar up 0.69% at 82.82 on the trade-weighted index, and crude oil down $2.38 at $82.44 per barrel. Black gold was seen heading for its worst losing streak in 13 years at this point. Commodities overall were also headed for a bad weekly losing streak; the worst one in 11 years. The slowdown in China (more on that later) is spooking speculators in "stuff" quite badly. Meanwhile, the euro fell back under the $1.2475 level against the dollar and US equity futures were tilted towards the red end of the price spectrum. All of this occurred despite otherwise somewhat positive market news such as China’s surprise 0.25% interest rate cut, an only modest decline of 12,000 in the number of US jobless claims filings, and the cut in ratings to BBB (quasi-junk) that Spain got slapped with by Fitch’s. The euro’s temporary stabilization above the $1.25 mark did not manage to lend a helping hand to gold either. Whether or not this proves to be only a temporary setback in prices remains to be seen but do note that the hefty gains achieved in the wake of last Friday’s poor jobs report have largely been wiped off the profit slate with the downward moves of the past two days. Speaking of profit slates having been turned upside-down, it did not escape or notice that the Paulson Gold fund (whose manager remains a strong adherent of yet-to-come stratospheric gold prices) posted a 13% loss in May and that it is now down by 23% on the year. Paulson & Co. has been seeking to repair losses of as much as 47% that had been recorded during 2011 in its Advantage Plus fund. The large, inflation-hedging and anti-dollar bet that the firm has made on gold has not managed to yield consumable fruit following the yellow metal’s ascent to a record last September. In addition, the market is now entering a seasonally slow period of physical offtake. Over in India, the festival and marriage seasons are over for now, and the focus is on monsoon season rains and crops and what to pay for them with. Record-high domestic gold prices have reversed the sales flow in Indian gold towards the country’s gold shops and not out of them. For a country that makes up over 25% of the global demand for gold, such a development is — to say the least — noteworthy. As TheStreet.com’s Robert Weinstein puts it, when it comes to gold "What happens in India does not stay in India." Market technicians now caution that gold needs to convincingly recapture (and keep closing in) the low $1,600s and that the Fed needs to ‘comply’ with the market participants’ "wishes" in order to regain its lost technical momentum footing. In the absence of either, the lower target of $1,525 or so would be back on the radar despite the assurances issued ever since Monday that "the worst was over" for bullion. Yesterday, following the tenor of the Bernanke testimony in DC, Nomura Global Economics said that it does not expect a change in the US central bank’s monetary policy when it meets less than two weeks from now. "In the meantime, $Gold and $Silver are in fantasy rallies. Physical demand for Gold and Silver has plummeted, meaning that the rally is again in paper Gold and paper Silver. The massive error in forecasts for U.S. employment showed that expectations for the U.S. economy clearly had become too optimistic." Perhaps that led some to believe that QE-3 was really imminent this time. This fantasy rally should be viewed with skepticism. The oversold condition has rapidly become an overbought situation. $Gold investors should expect price weakness to again develop, but should hold their Gold due to the longer term situation." "Silver investors face a far more worrisome situation. Silver price approaching $30 is totally unjustified, given the ominous supply/demand situation developing. Silver production is going to be far higher in the future than the forecasts. Demand, having already collapsed, will be well below forecasts. Silver investors should consider switching into Gold. Those that might have a need for funds in the remainder of the year should consider raising that money through Silver sales." "The unexpected bullish assessment in this report will likely dampen the enthusiasm for policy easing among some Fed officials who may use it as cover for inaction at the June FOMC meeting." Recall that we had warned here on Wednesday (as well as on several other occasions) that the over-dependence on more Fed stimulus in terms of enhancing the chances of certain assets to climb to higher price levels was a dangerous game that might or might not pay off under certain circumstances. In this particular case, it obviously did not. Speaking in front of Congress, Mr. Bernanke’s tone was not indicative of an emergent US economic crisis of some sort. The Fed Chairman actually sounded somewhat upbeat about the US outlook, noting that the country’s exports have held up well recently, despite the problems in Europe. Mr. Bernanke’s Capitol Hill session ended with no more of a concrete mention of QE3 than the fact that any Fed accommodation will be contingent only upon significantly higher levels of economic and/or financial stresses becoming manifest. This is perhaps where the "problem" (as well as Nomura’s take on matters) for QE3 fans could lie; it is hard to see what out-sized negative development could appear between today and the FOMC’s meeting date, especially now that the "worst" metric (last week’s jobs figure) is already in the "mix." Speaking of gold and the Fed, our good friend Jeffery Christian of CPM Group New York hit the television circuit this week and, as usual, provided some very cogent insights into the action in the gold market. The first clip we’d urge you to see is "Why Gold is Recovering" which appeared on Canada’s BNN network. Jeffery lays out the reasons behind the surge in prices one week ago and poses certain other questions which the market "answered" this week. His second interview took place on CNBC and it reveals the fact that — contrary to current perceptions and expectations — gold prices have actually been stronger in periods where there is an absence of QE-type actions by the Fed. Jeffrey argues that folks might be misinterpreting what QE3 could mean to the markets and what central banks are prepared to do in the event conditions deteriorate further. He also noted that while some investors appear to have lost interest in the gold safe-haven play, others are still possibly interested in acquiring it but will likely not try to chase after it in a rising price environment. 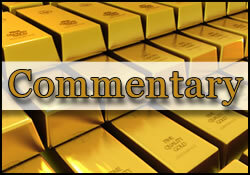 Thus, Jeffery opines, forecasts of $2K gold are still overly "aggressive" at this juncture. Moving on to China, the PBOC took the markets by surprise and did that which the ECB was not (yet) willing to do earlier in the week and which the Fed is unclear about doing; it cut its benchmark interest rate by 0.25% to 6.31% effective from today in order to boost flagging economic growth. This was the first such cut since 2008 and it signals the rising concern by the country’s leadership regarding the slowdown that continues to spread. The world’s second largest economy is now on course to record its worst quarterly growth rate in three years. China observers have opined that the PBOC’s move is sort of a pre-emptive measure intended to dampen a possibly dour set of economic data set to be released over the weekend. The Guardian also reported that "On top of the cuts, Beijing shocked economists by partially liberalising interest rates. In an attempt to amplify the effect of the rate cut, it relaxed rules so that banks can offer a 20% discount to the benchmark lending rate, compared with a previous level of 10%. Société Générale economists said this was “a game-changer for China’s financial market, seemingly presenting a point of no return”. The package sent a clear signal that the government is worried about sharply slowing growth, weak exports and faltering investment." If China’s economic expansions were to fall to the 7% level it would imply that the "hard landing" label could be applied at such a juncture. But, even if such a "runway incident" does not materialize, the country is thought to be facing difficulties in living up to its stated growth target of 7.5% in 2012. Mr. Andy Xie, an economist and board member of Rosetta Stone Capital, believes China could struggle to meet even the lower growth target. "The days of easy growth are gone, meaning that the government must address problems linked to low household income and excess investment." "Credit Suisse said Monday it believes China is now entering a structural downturn, pointing to important changes in the housing market and a currency that no longer appears undervalued, as among six factors that appear "less promising" for China’s growth outlook." "Harold Hotelling was an economist who developed Hotelling’s rule which showed that as long as the price of a commodity was believe to be going up, the value would go up or down with changes in the cost of storage, that is, the real interest rate (interest less inflation). While this rule doesn’t necessarily apply in all cases, it has been very good at predicting the price of gold since 2008. A Hotelling Moment would be when investors/speculators become so convinced that gold will go up that they buy as much as they can afford and the price moves up or down primarily with the cost of storage." "A Reverse Hotelling Moment occurs when speculators become uncertain that price appreciation will continue. At this point, price changes become disconnected with drops in interest rates. This appears to have happened on February 28 when gold started to drop while interest rates remained low. With interest rates at current levels, gold should be between $1750-1800 per ounce if Hotelling’s rule was still working." The author also — and this is equally important — makes some very relevant observations about the truth of the matter as regards supply (up) and demand (down) in the gold market of late. Give his findings a read this weekend.